My Way has been promoted as the most expensive Korean blockbuster yet produced. It has had a handful of cinema screenings in the UK courtesy of the Terracotta Film Festival but it is released today on DVD by Universal in the UK. (Co)writer-director Kang Je-gyu was one of the principal figures in launching the concept of the Korean blockbuster with his earlier films, Swiri (Shiri, 1999) and Taegukgi hwinalrimyeo (Brotherhood 2004). The Korean concept of a blockbuster is slightly different to the Hollywood concept. The term tends to be used for any film that gets a wide release and which attracts a large number of admissions – i.e. the term refers more to distribution and exhibition than genre or narrative. All kinds of films have become blockbusters in South Korea, but often it is their appeal to aspects of Korean culture that is important. Kang Je-gyu’s films have been blockbusters in both the Korean and the US sense. Shiri and Brotherhood both dealt with North-South conflicts in Korea, the latter with the 1950-53 Korean War and a story about brothers caught up reluctantly in the fighting. This spectacular war film attracted over 11 million admissions in South Korea (about a quarter of the population). My Way has a similar structure and theme as Brotherhood, but takes on an even bigger story that crosses Asia from Korea to the D-Day beaches of 1944. 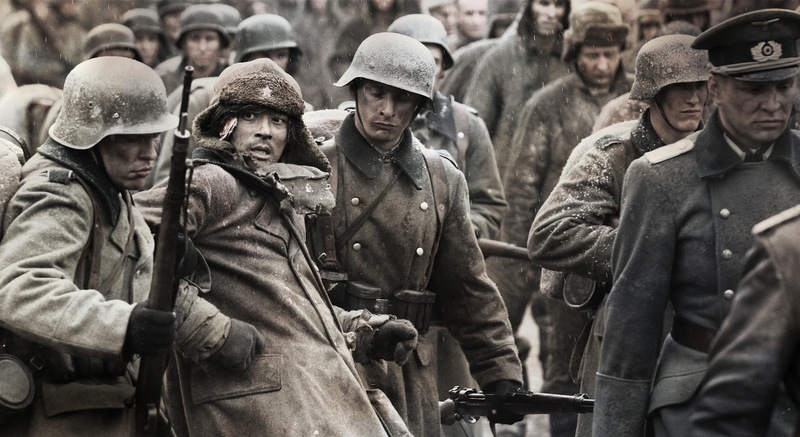 Kang was inspired by a reported historical event – the capture of a Korean soldier in a Wehrmacht uniform by American forces during the D-Day landings. Kang discovered the elements of the man’s story and then added another intriguing element of his own. My Way begins and ends with a marathon runner during the 1948 London Olympics. The remainder of the 142 mins is a long flashback that begins in 1928 with two small boys racing each other. One is Kim Jun-shik and the other is Hasegawa Tatsuo, son of the Kim family’s Japanese colonial landlord. Tatsuo has his future mapped out as an officer in the Imperial Japanese Army. As a child he revels in the tussle with his Korean friend but ten years later he will face Jun-shik again in an ‘all-Japan’ trial. Jun-shik can’t be allowed to win and instead he is ‘pressed’ into the Japanese Kwantung Army in Manchuko (Manchuria). He becomes an unwilling participant (with other Korean pressed men) in the major battle with Soviet Russian forces on the Mongolian border in 1939 – where he again comes up against the now Colonel Hasegawa. Both men are captured by the Soviets and put in a Siberian work camp from where in 1941 they are pressed into the Red Army and after a battle with the Germans they escape westwards only to end up in a German work battalion on the Western Front. During this long trek they work through their personal antagonisms. The emphasis in the film is on the epic battles fought in Manchuria/Mongolia and on the Eastern and Western European fronts. Kang Je-gyu uses CGI extensively and re-created his version of the D-Day landing at Utah beach in Latvia on a budget of $3 million. The cinema screening I saw was missing most of the subtitles because of a projection problem with the digital print. Since the film includes Korean, Japanese, Mandarin, Russian and German dialogue this could have been a major problem. In reality, although I might have missed some of the nuances, I think that I could follow most of the film fairly easily. Certainly, I was not bored at any point through 142 minutes. My Way is not an art movie. It’s a popular epic war movie with masses of CGI. It could be compared to Hollywood films like Pearl Harbor (which I haven’t seen) and that seems to be what most US critics have done, seeing it as just another bombastic mindless adventure movie. I think it is the Hollywood Reporter review that derides it as “blowing itself to bits”. I’m not going to claim that the film is an incisive analysis of war in the twentieth century, but I think that it deserves a little more consideration, at least as a project if not as a successful film narrative. My first thought was that as a rare East Asian film that attempts to represent historical events in Europe, My Way offers a lesson for superior European critics. I felt myself about to scoff at an opening which pretends to be London, before I checked myself after realising that I have no idea what Seoul looked like in 1948 – just as I had little idea of the major battles fought between the Japanese and Russians over the Mongolian/Manchurian border in 1939. Kang has to be applauded for the ambition of his storytelling. He is also very brave to take on Japanese-Korean relationships in the 1930s and 1940s. The strategy for this big budget film was to use major stars from Japan, Korea and China to attract a Pan-Asian audience. Jang Dong-geon (who plays Jun-shik) and Odagiri Joe as Tatsuo have to carry the film. Fang Bingbing has a much smaller role as a Chinese sniper in Manchuria and other than Kim In-gwon as Jun-shik’s friend, pressed into the army at the same time, none of the other characters in the film are developed. The strategy appears not to have worked in the sense that My Way attracted only around 2 million admissions in South Korea and a fraction of that number in Japan. I haven’t seen any figures for a Chinese release as yet. The Korean producers are looking at a significant loss with a worldwide box office take of only $16 million. On reflection, the loss of subtitles in the screening I attended probably didn’t help me understand the changing relationship between the Korean and Japanese characters and that relationship may be the stumbling block for audiences in both countries. I’m not sure what Chinese audiences might make of the film. The current animosity towards the Japanese won’t help but at least the film does offer an East Asian perspective on events in the 1930s and 1940s. In fact, rather than Hollywood films, My Way resembles Chinese epic productions and I notice that the film’s release in Korea and Japan at the end of 2011 coincided with Zhang Yimou’s latest epic production Flowers of War (China/HK 2011) about the massacre in Nanjing in 1937 – not the best time to release a film about the Imperial Japanese Army, even if the focus is mainly on the Koreans forced to serve in it. This entry was posted in East Asian Cinema, Korean Cinema and tagged combat film, Japanese colonialism, war film. Bookmark the permalink.